These photos were taken in June of 2008 just outside of a hotel we were staying at on Maui. 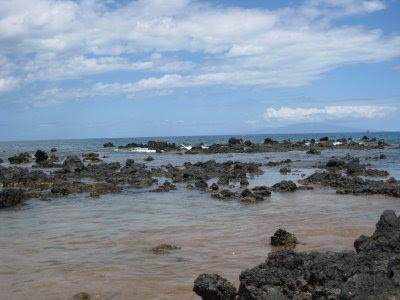 Unlike many hotels that are right on the sand beaches, our hotel was situated where the black lava rocks and the ocean meet. 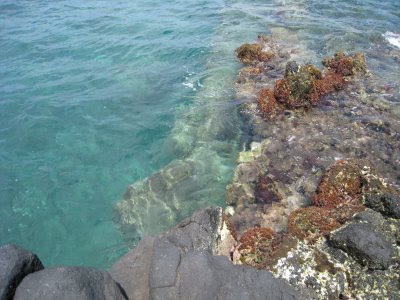 This created many small tidal pools in the lava and allowed for close looks and many marine species. This is what the area all around our hotel looked like. This was taken at high tide. 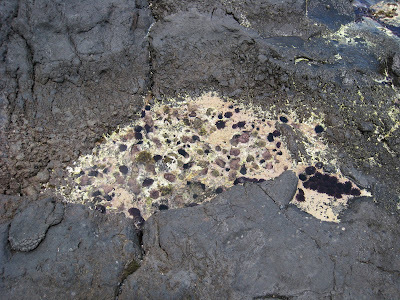 At low tide, it was easy to find these small black crabs all over the lava rocks. During low tide, many species became visable in the shallow pools of water. The variety of species and colors are incredible. It was also amazing to me how quickly the ocean dropped off at the edge of the lava. It went from just a few feet deep at the most on the lava to at least 20 feet deep within just a few feet. To see more great Water Wednesday posts click here. Lots of interesting rock pools to explore. 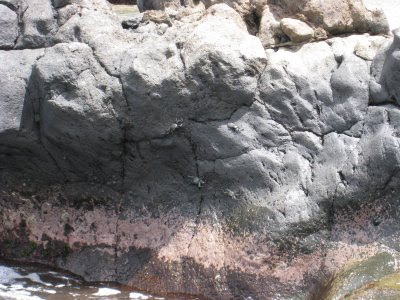 Lava rocks always fascinated me, I hope I get to see some someday. I LOVE to look at tide pools, you could spend hours looking at tiny little things in the water. Cool. Cute tiny crabs, too. I especially like the last photo. I could almost feel the cold water. What an interesting post, those photos are great. Would love to explore those tidal pools. Great photos for your post. Love the last one. That water looks sooo nice - very welcoming! I'd love to jump in!!! Those are all great shots, the weather looks outstanding, I am envious. Fascinating study in contrast to typical sand beaches. But the water is the same, more or less. It wears many different coats. I especially like the last shot of the water and the color you found. Nice presentation. Glad to know you took the time to explore and enjoy the tide pools when you were in Hawaii. So many visitors to our islands stick to the sandy beaches and overlook all the life on the rocky shorelines. Unbelievable!!! That last pic is amazing!!! I'm jealous....what more can a poor norwegian say these days! Never seen lava - only when I follow programs in "National Geografic".....with interest! I so want to go there. Beautiful photos, thanks for sharing. glorious teal/aquamarine water. i too am jealous.